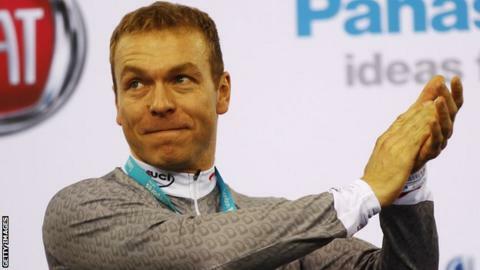 Sir Chris Hoy says cycling must "break the chain" with those who have a history of doping in the aftermath of the Lance Armstrong confessions. Armstrong admitted to doping during all seven of his Tour de France wins. "We must break the chain of the past to the future and not include people who have been involved with that," Hoy told BBC Radio 5 live. "It is a tough thing but the sport is trying all it can to reform and change - and to make the future better." The six-time Olympic track cycling gold medallist also believes the way to rebuild the sport's reputation is by ensuring all competitors are clean. "It's all about how we can work to stop this sort of thing happening again in the future," said Hoy. "The way we stop that is show that you can do it clean - you look at Bradley Wiggins in the Tour - and increase the testing as they are doing now: the whereabouts scheme, where you have to be available every day for testing, and tell the testers where you are. "You could be tested on Christmas Day, you could be tested anywhere at all, they could come randomly - these blood and urine tests weren't around to the extent that they are now in the early 2000s when Lance was winning the Tour. "The Tour de France is a different kettle of fish to what I do, but it doesn't matter what you do - if you're on two wheels you do the best you can and do it clean." Though Armstrong was banned for life by the United States Anti-Doping Agency (Usada), five of his former team-mates were handed reduced bans of six months because they gave evidence against Armstrong. Hoy, 36, admits the damage done to the sport is frustrating. Rabobank ended its sponsorship of its professional cycling team in November following the Armstrong revelations. "It is frustrating when you're a cyclist and your sport is brought into disrepute and people ask questions of you and your branch of the sport," he said. "But you have to accept that and you realise all we can do as cyclists is go out there and compete clean, try to win and try to show the next generation of cyclists you can do it clean," said Hoy. After years of denial, Armstrong - who has recently said he is a "fall guy" for cycling's doping culture - admitted to taking performance-enhancing drugs Erythropoietin (EPO), testosterone, cortisone and human growth hormone as well as having blood transfusions. His confessions have prompted others to come forward, with Danish cyclist Michael Rasmussen the latest to admit to taking performance-enhancing drugs. Luxembourger Frank Schleck will miss the 2013 Tour de France after he was given a one-year backdated ban for failing a drug test during last year's race - though Schleck has denied knowingly taking a banned substance and can appeal to the Court of Arbitration for Sport (Cas). Hoy was speaking on BBC Radio 5 live's BeSpoke podcast, which is available until 3 March, 2013 from here.